The growth of consumer prices in Ukraine in 2017 accelerated to 13.7% compared with 12.4% in 2016, which, however, is significantly lower than in the past years: it was 43.3% in 2015 and 24.9% in 2014. Industrial prices in Ukraine in 2017 increased by 16.5% against 35.7% in 2016, 25.4% in 2015, and 31.7% in 2014. The national budget of Ukraine for 2018 provides for the allocation of UAH 86.9 billion for funding the healthcare system, which is 15% more than in 2017 (UAH 75.1 billion). Industrial production in Ukraine in 2017 decreased by 0.1% compared to 2016, and in December it decreased by 0.5%. 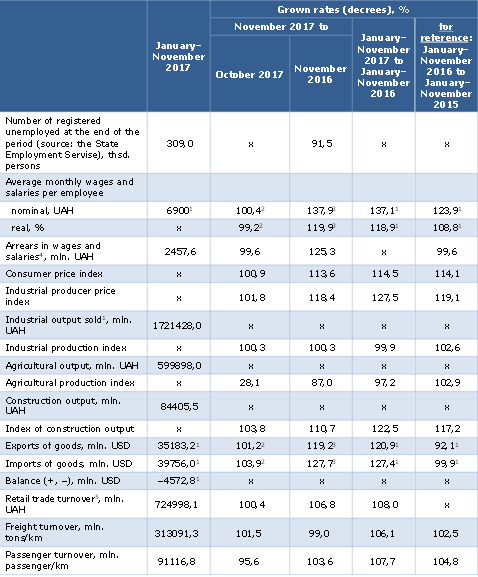 Agricultural production in Ukraine (excluding the temporarily occupied territory of Crimea and Sevastopol, part of the ATO zone) in 2017 decreased by 2.7% compared to 2016. More statistics see at the table below.